Drowning is one of the leading causes of accidental death, with rates even surpassing traffic accident fatalities in recent years. No parents want their children or anyone else in their family to become part of that statistic, and fortunately, you can take a very simple preventative measureTo keep that from happening. 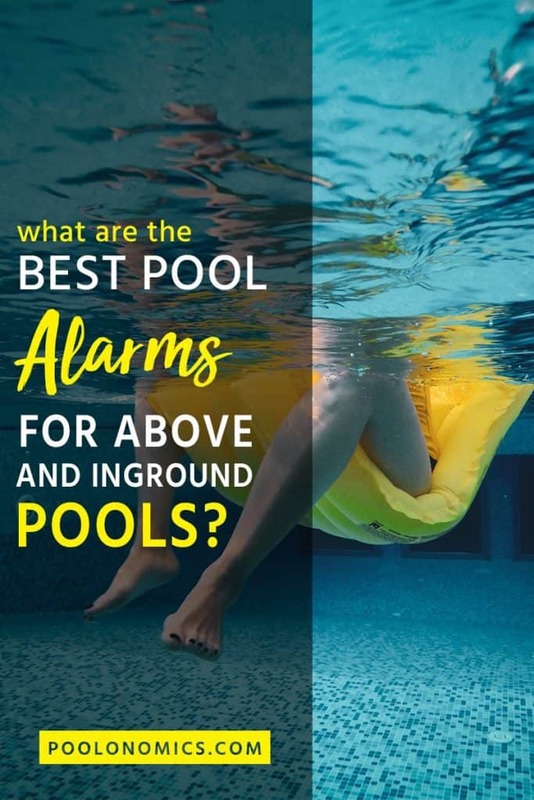 The following pool alarms have been chosen for comparison since they’re regarded as the most trusted and popular options among pool owners today. When Should You Buy A Pool Alarm? There are a number of reasons (or benefits) to get yourself a pool alarm, and if you’re reading this buyer’s guide, you’re no doubt aware of at least some them. Saves lives: Drowning is a serious cause of death for all ages, but especially for children with most drownings between the ages 1 to 4 occuring in home swimming pools. It’s worth the cost a million times over if it saves a life. Unobtrusive: Despite what many believe, most pool alarms are designed to be unobtrusive, meaning they don’t get in the way or negatively impact pool’s aesthetics or the swimming experience. Gatherings: If you like to host gathering or parties in your home, it’s always a good idea to have an alarm installed since you never quite know who will be roaming about your backyard unattended. Animals/Pets: While many will consider a pool alarm for young children and non-swimmers, it’s easy to forget about the pets in your household that may also be at danger of drowning. Required by law: Whether you have an inground or above ground pool, some states even require you to have a pool alarm by law if your pool a exceeds a certain depth — and it won’t pass an inspection otherwise. When Shouldn’t You Buy A Pool Alarm? Not every purchase makes sense for every person in every situation, which is why I’m also going to list off some reasons why you might decide AGAINST getting a pool alarm. No children: Children are most likely to benefit from a pool alarm if an accident were ever to occur, so if you don’t have children, you may want to reconsider getting one. No pets: As well as children, if you don’t have any pets that might find themselves falling into (or stuck in) your pool, you’re running out of reasons to install one in the first place. Swimmers: If you have a family of competent swimmers, a pool alarm will likely be more of a nuisance than a saviour. Shallow pool: For obvious reasons, a pool alarm is rarely justified on a shallow pool (or paddling pool) unless you have very young children roaming about. What Types Of Pool Alarm Can You Buy? When looking at the different types of pool alarms available, it can sometime be hard to know what to go for. As with most things, there’s really no one-size-fits-all solution. It’s simply a case of understanding what your options are so you can make a more informed buying decision. The door/gate alarm is one that is typically installed on a door or gate leading to your pool area, but can also be applied to windows as well. It’s a very straightforward system that relies on a proximity sensor, with one part being placed on the frame, and the other on the actual door, gate or window. As soon as these pieces are separated, the alarm will sound. This particular type is great against children because it’s often placed higher up where they are unable to reach, and features a bypass button or code input so adults can disable it momentarily. Perhaps the biggest downside to this type of pool alarm is that it’s the most obtrusive/unnatractive, which may be a deal breaker for some. Surface wave alarms are battery powered devices that sit on the surface of your pool, looking for any disturbance that might indicate someone (or something) has entered the water. Much like a door alarm, this sensor is also made up of two parts, with one one being placed in your home (to alert you), and the other floating on the pool surface itself. The great thing about this type of pool alarm is that it can quickly and easily be removed from the pool and left on the ground if you’re using the pool, and then placed back in after use. There are some downsides, however, including potential false alarms from strong winds or debris, as well as frequent battery changes being a common issue for the less expensive models. A subsurface pool alarm is often a more permanent solution that also monitors water disturbance at, you guessed it, the subsurface level. Unlike the surface sensor alarms (type 2), some models are not required to be removed from the water, but instead disarmed by code input or remote, and rearmed similarly, or in some cases automatically once the pool water becomes still. The only real downsides to this type of pool alarm is that it will mounting to the side of your pool, which isn’t viable for some setups (especially above ground pools without a pool deck). 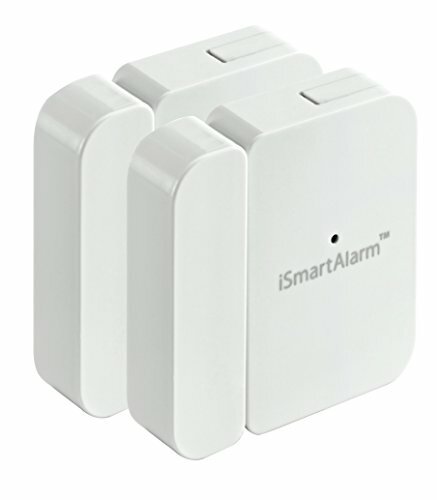 There’s also the fact that these are typically a lot more expensive than surface wave alarms, but, as with most things, you really do get what you pay for here and I would recommend this type of alarm for the best protection. 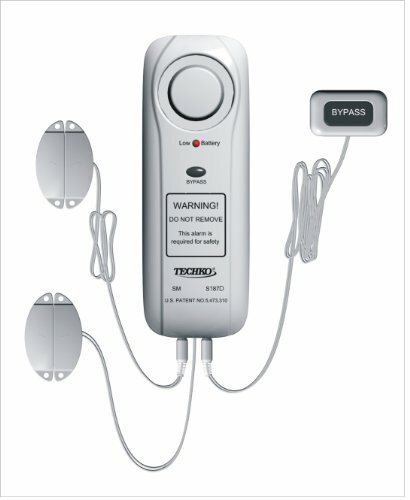 The immersion alarm is the most unique in the sense that it attaches to a person (typically a child) and not the pool or pool entrance itself. The biggest benefit here is that it’s portable, meaning it can work with any swimming pool in any location, as well as ponds, lakes and even at the beach. On the other hand, it only provides protection if it’s actually being worn, so if your child takes it off in order to enter the pool without permission, there goes your warning system. It’s also not ideal for pets, so if that’s your primary reason for buying a pool alarm, you better skip over this one. Knowing which type of alarm to buy will narrow your options down to some degree, but it still doesn’t tell you what the right product is. If you really wanna narrow down your options, you have the look at what makes a great pool alarm, well, great — and finally compare each device side-by-side to get your winner. Compatibility: Not all alarms are suitable for every pool or situation, which is why it’s important to consider whether it’ll work well with your small or large, inground or above ground pool. Sensitivity: If your pool alarm is more sensitive than a hormonal woman, you may have to deal with one too many false alarms. If the sensitivity is too low it may not trigger when needed. Durability: This is the last thing you want breaking down on your without your knowledge, so it’s crucial to go for something that will not only last a long time, but will warn you of impending failure. 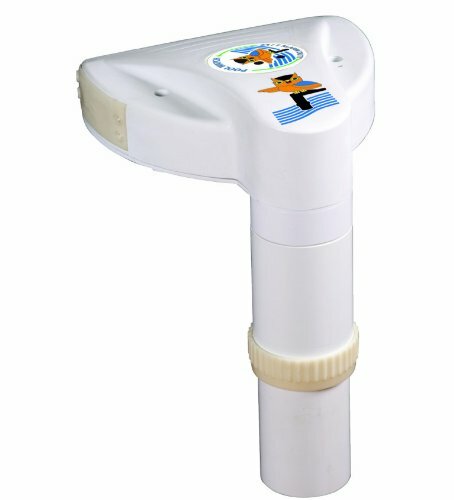 ​​Compatibility: Will It Work With My Pool Setup? Compatibility refers to how suitable a particular alarm is for a given swimming pool, usually based on things like pool size, depth and the particular style of pool you have (inground or above ground). I’ve covered these aspects to some degree when talking about the different types of pool alarms available, but all of them will be accounted for my individual reviews, coming up shortly. ​Sensitivity — Does It Trigger Appropriately? Sensitivity is something you may not have expected to see as a comparison factor here, but it can actually vary a lot from alarm to alarm. And while you might be inclined to get something that kicks off at the slightest sign of danger, that can sometimes be more inconvenient than the added safety it provides. For example, a storm can cause movement in your pool which may be confused with a person entering the water if the sensitivity is too high. In some cases, you may even be forced from your bed to go out and disable it. On the other hand, if the sensitivity is too low, it won’t be enough to pick up small animals falling into the pool, which could prove fatal for cats and some dog breeds. While the biggest question here would be the level of protection you need and who you’re trying to protect, there are alarms that are simply too prone to going off, and others that will wait for world war 3 before making a peep. ​Durability — How Long Will This Thing Last? Last, but certainly not least, is durability. Perhaps the easiest way to ensure buying a long-lasting alarm is to go with a trusted brand — as in one that has a track-record of manufacturing high-quality products. Of course, unsurprisingly with something technical like this, the more you spend, the better quality you’re likely to get and the longer it will last. In other words, you get what you pay for when it comes to pool alarms, and considering how vital they are to the safety of your family, it’s not a piece of equipment you want to skimp on. I’ll be looking carefully at this aspect for each individual pool alarm review. The points above are, in my opinion, the most important things to consider when it comes to buying a pool alarm — but not necessarily the only things. Alarm Volume: It’s not uncommon for some of these life-saving devices to be a little quieter than you had anticipated, which is a deal-breaker if you need the sound to cover some distance. Battery: Anything that relies on a battery to function is always vulnerable to power issues, and the last thing you want to do, especially with something like this, is remember to swap out the batteries every few months. Practicality: It doesn’t matter how well laid out the specifications are, there are certain nuances to each individual pool alarm that can make it huge win or a massive fail — such how easily it attaches to your gate, or how long it takes to re-arm after a swim session. Installation: As with anything technical, you don’t want to spend all day setting it up. That’s why I’ll also be looking at things like setup instructions and installation time. Now that we’ve covered what to look for in a swimming pool alarm, you’ll be able to use the comparisons below to make a more informed decision about which makes sense for you and your needs. 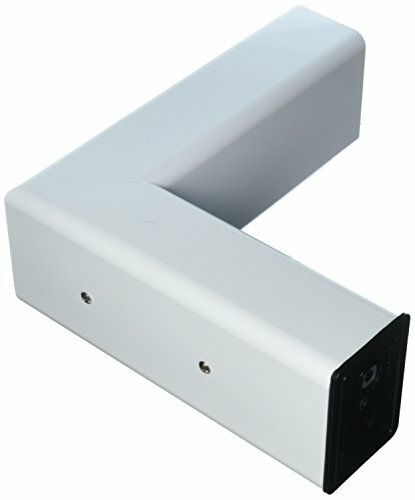 The DWS3R from iSmartAlarm is a motion sensor door/gate alarm with an average battery life of around 8-10 months. This particular model also comes as a pack of two sensors, which can be useful for covering more than one entry/exit point. This alarm comes with a free Android/iOS application that can be used to control the alarm and it’s settings remotely, and you can use this to set up an phone number when the alarm triggers – sending an emergency text message, phone call, or both. There is a slight issue with the motion sensitivity however, with many users reporting false alarms on occasion, and that could be a deal-breaker considering the lack of setting control in this regard. 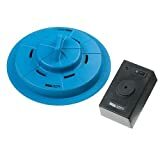 The S187D from Techko is a door/gate pool alarm with a very low battery life according to user reports. For some reason, the manufacturers didn’t bother to include setup instructions with this product, making installation more cumbersome and drawn out than it perhaps should be. The GAPT-2 from Techko is yet another battery-powered wireless door/gate pool alarm, and one with a respectable battery life according to user feedback.What I like about this particular model is the overall build quality, which is considerably high for the price point, as well as how easy it is to install — with many users up and running in as little as 5-10 minutes.It’s hard to find any real gripes with this product, but it’s worth pointing out that the alarm does have a 7-second delay before it triggers — which some might consider a little long. After all, those extra few seconds could mean everything. 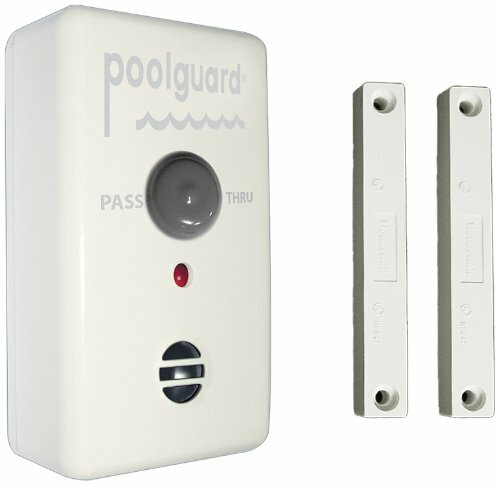 The PA-30 from Pool Patrol is a wireless, battery-powered surface wave pool alarm with a rotational top to adjust the sensitivity. 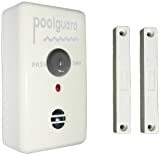 If you’re looking for a surface wave pool alarm, this is, in my opinion, one of the better models you can buy considering the volume, quick installation and overall ease of use. The downside with this particular product, however, is that the adjustable sensitivity doesn’t always work very well. In some cases, a large splash will not set it off, and in others, it can be triggered by a strong wind.It’s also worth noting that shutting off the receiver will not silence the alarm, so you have to manually go out to the pool and disable it yourself. This is obviously a huge inconvenience the event of a false alarm. The PGRM-2 from Poolguard is a battery-powered subsurface pool alarm, suitable for both inground and above ground pools, the latter being possible without drilling if the deck is very even. This particular alarm is very loud, so you can rest assure that whether a child or pet enters the pool, you will know about it immediately. It can then be deactivated with a magnetic key fob. 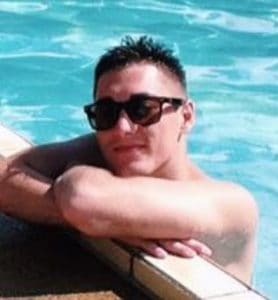 You will need to remove it from the pool before swimming, and doing so can be a nuisance as you’ll occasionally—but only momentarily—set off the alarm. Still, doesn’t hurt to test it now and again, right? The NA4212 Poolwatch from Blue Wave is another battery-powered wireless subsurface pool alarm. Blue Wave claim this particular model will pick up anyone (or anything) entering the pool weighing 18 pounds or more, which covers most small dog breeds but not all. Cats would also be at risk of not setting off the alarm. Easily the biggest drawback of this product is how unreliable it is in terms of sensitivity, with some users claiming it works flawlessly, and others saying a light wind can trigger the alarm to go off. The Child Immersion Kit from Safety Turtle is a battery-powered, wireless wristband alarm alarm that works in swimming pools, ponds, lakes and even in the sea. As with any immersion alarm of this type, the biggest challenge is getting your child to wear it at all times. Fortunately, the Safety Turtle 2.0 is actually very comfortable to wear so the kids will forget it about it in no time. 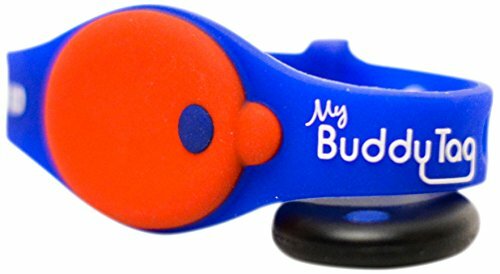 Due to the nature of a wristband alarm, it is possible to set it off by getting it wet accidently, such as in situations when your child is washing their hands or simply out in the rain. A pool alarm is one of those purchases you know you should make, as it really could be the difference between life and death when it comes to your family and/or pets. Unfortunately, it’s also something that—unlike most pool equipment—takes a good level of research and understanding in order to make a decision. The right decision. The good news is, if you followed my buyer’s guide (and reviews) from start to finish, you’re already in a much better buying position than most.